Have you ever heard of a One Sheet Wonder? 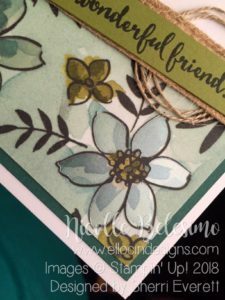 It’s when you use ONE sheet of patterned paper to make multiple, coordinating cards. If you google “One Sheet Wonder” or enter it into Pinterest, many, MANY examples pop up! Some are designed for 6 x 6 inch paper, some for 8 x 8, some for 12 x 12, and I’ve even seen some for 8-1/2 x 11 inch paper! Some are super simple, while some are pretty intricate. 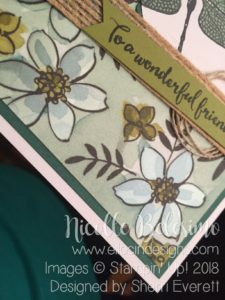 However, regardless of the size or level of detail, one sheet wonder projects are a great way to make a bunch of beautifully coordinated cards! The template I chose to use for my project today uses one sheet of 6 x 6 inch designer series paper! 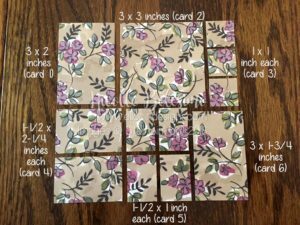 I found the template on Pinterest, and it linked to a blog post of a fellow papercrafter by the name of Kathy Roney. The template I used is her original design. Although I switched up the cards a bit to put my own spin on them, I did use her template, and I definitely want to give her credit for creating it! 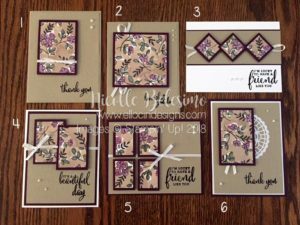 If you would like to see her original template and the gorgeous cards she created with it, please click HERE. 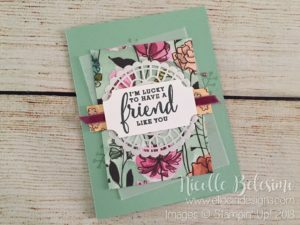 I hope you’ve enjoyed my post today! If you have any questions about this project, please don’t hesitate to ask! 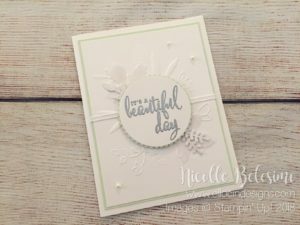 This gorgeous card was one of the cards I made on Saturday in Maine! It was designed by my friend and fellow demonstrator, Sherri Everett! 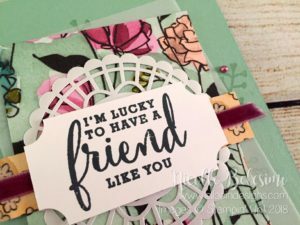 She held a card buffet where you could go and make as many cards as you wanted, and it was so much fun! It ended up taking me almost five hours to get there, so I didn’t have as much time as I would have liked, but I still got to make six full cards, and I took four kits home to make with supplies I have at home. 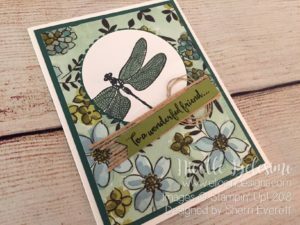 Sherri’s designs are really beautiful! 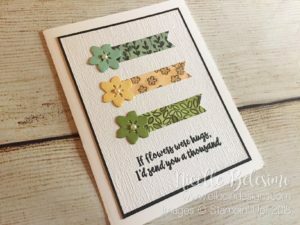 This was the first one that caught my eye, as green is my favorite color, and there are multiple shades of green on this card. 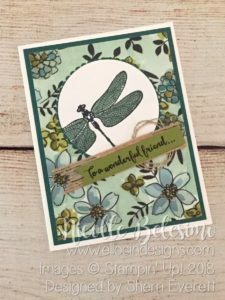 Plus I LOVE dragonflies, so this was one I definitely needed to make! 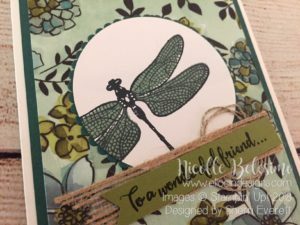 This card features the Dragonfly Dreams stamp set, as well as the NEW Share What You Love Specialty Designer Series Paper! Layering Circles Framelits were used to cut the circle with the dragonfly, as well as the scalloped piece behind it. 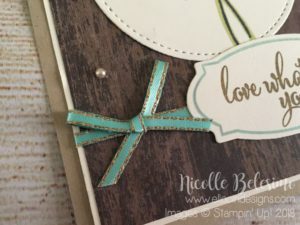 It’s embellished with Burlap Ribbon, as well as some Linen Thread, and the sentiment piece was trimmed with Paper Snips, but the Triple Banner Punch could be used as well! 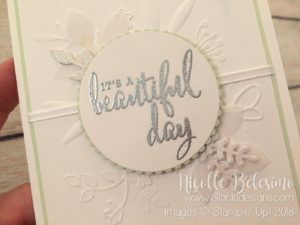 One thing I really love about the Designer Series Paper that Sherri used for this card, is that some of the designs have beautiful, iridescent accents! This design is one of them, and I tried to get some good pictures of the accents, but it’s hard to see. All of the largest flowers on this design have the iridescent finish, and they are so pretty in person! 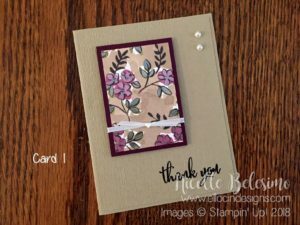 It adds such a nice touch to this card! I have many more cards that I made on my trip, and I will share them with you hopefully over the next few weeks! Thanks for visiting today! Please let me know if you have any questions! Today’s card uses mostly NEW product from the new annual catalog! 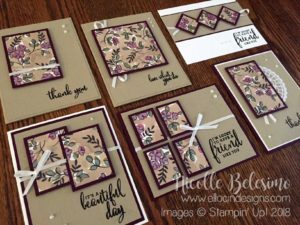 The sentiment is from the Abstract Impressions stamp set, the paper banners are from the Share What You Love Specialty Designer Series Paper, and the embossed background was made with the new Subtle Dynamic Textured Impressions Embossing Folder. 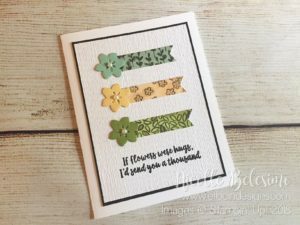 The flowers were die cut with a die from the Seasonal Layers Thinlits Dies. Please see below for the complete project list for this card. And don’t forget, the Buy 3 Get 1 Free Designer Series Paper sale starts July 1st! 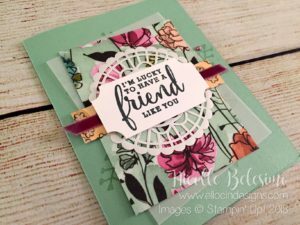 While the Share What You Love paper is NOT included in the sale, there are lots of other gorgeous ones that are! Thanks for stopping by today! Happy Friday! Today’s project is one of the make and take projects we made at last month’s OnStage event! 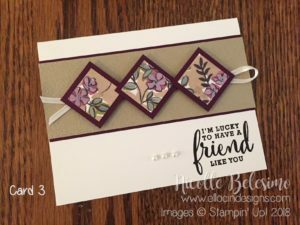 This card uses multiple products from the NEW Share What You Love Suite, which is now available as an early release from Stampin’ Up! 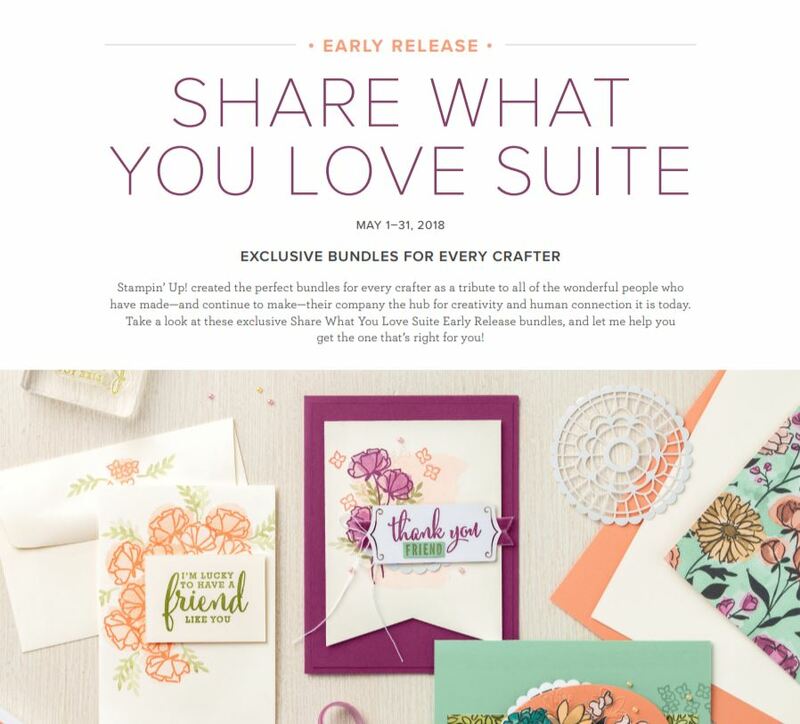 All of the products used on this card can be ordered NOW instead of waiting until June 1st, when the rest of the new catalog becomes available for ordering! 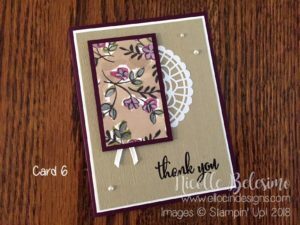 This card was my favorite of the four projects we created at OnStage! 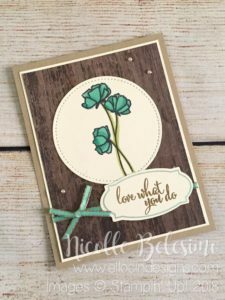 The base of this card is the returning Mint Macaron! I am so excited that this color has returned as a core color! It is one of my all time favorites, and I am thrilled that it is back! This color, combined with the rest of the colors in the suite, makes for some stunning color combinations! It also features Mint Macaron card stock, vellum card stock, and Memento Black Ink. Also, the corners of the sentiment piece were cut with a 1/2 inch circle punch to make the inverted rounded corners. 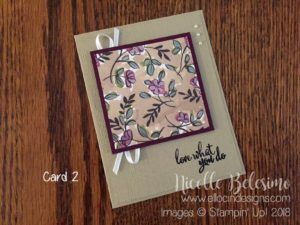 Most of the products used on this card are now available to order as part of the Share What You Love Suite! These products are available in exclusive bundles, now through May 31st! You can browse the early release items in the online store HERE. Thanks for stopping by today! Please let me know if you have any questions! My Final OnStage Display Board Project! 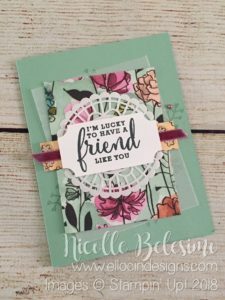 Both projects use many of the same products, including the Love What You Do stamp set, the Wood Textures Designer Series Paper, the Bermuda Bay, Pool Party, and Old Olive Stampin’ Blends, and the Tea Room ribbon! 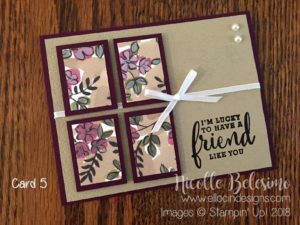 However, on today’s project, the sentiment is not heat embossed, but rather stamped in Soft Suede ink, and framed by an outline stamp and framelit from the Rose Wonder stamp set and Rose Garden Thinlits Dies (which are retiring May 31st.) The ribbon is also tied in a bow for the card! 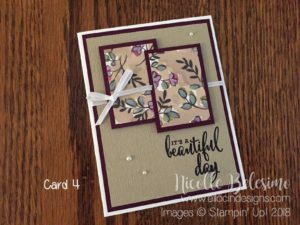 This card was embellished with the NEW Tea Room Ribbon Combo Pack, as well as a few Pearl Basic Jewels that have been colored with an Ivory Stampin’ Blends Marker. The ribbon will be available June 1st and comes in pack of two colors: Very Vanilla and Coastal Cabana. The ribbon is 1/8 inch wide, and has beautiful Copper edging, which you can see nicely in the picture directly above! So that’s it for my OnStage Display Board samples. I hope you have enjoyed what I have created! 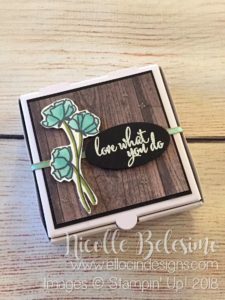 Don’t forget, the Love What You Do stamp set is available NOW to order as part of the Share What You Love Early Release, now through May 31st! Click HERE to go to the early release section of the online store! 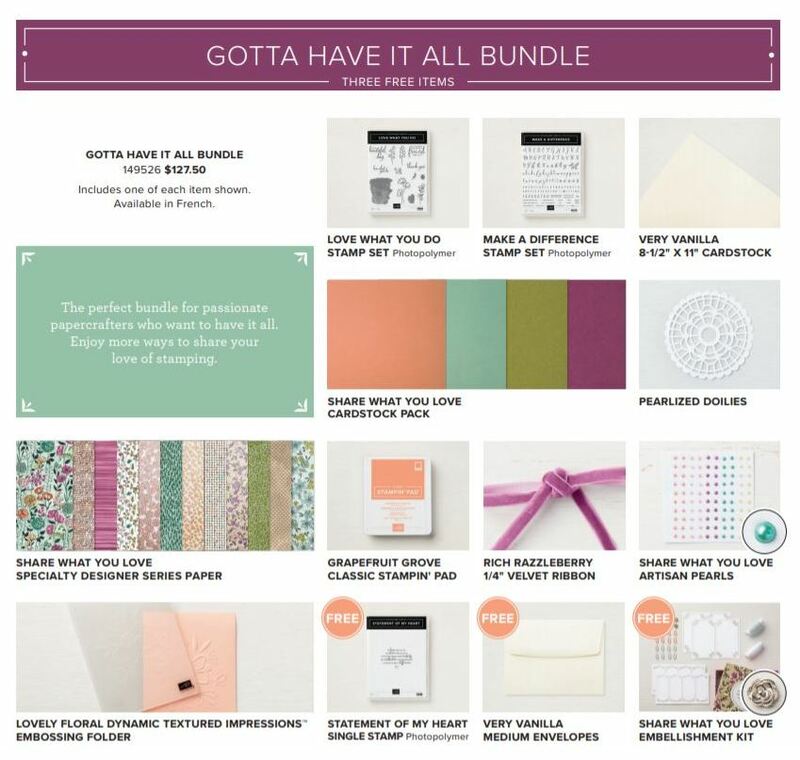 Each of these bundles can be ordered with only ONE item number! Simply enter it into the ordering screen in the online store and all of the items in the bundle will be added to your shopping bag! There are also free gifts being offered with each of the Share What You Love bundles, so be sure to check those out as well! If you would like more details on this offer, you can read my original blog post about the early release HERE. Item numbers for each of the bundles can be found in the images above, or click on the images below to be taken to the bundles in the online store! But don’t forget, this is a limited time offer, only for the month of May! If you have any questions, please feel free to ask! 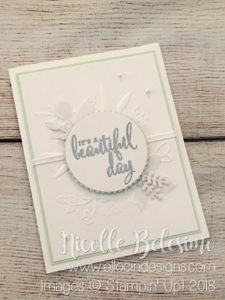 This bundle is the most basic of the three, and is perfect for beginning stampers! 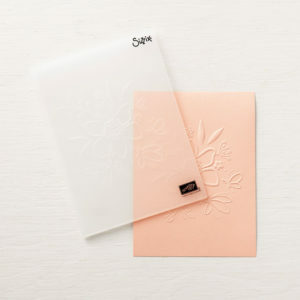 It includes a free gift of Very Vanilla Note Cards and Envelopes (a $6.50 value)! This bundle costs $57.00 (before tax and shipping), and the item number is 149524. 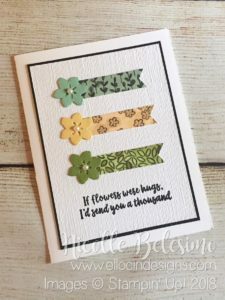 This bundle is a bit of a step up from the first and includes TWO stamp sets, as well as TWO free gifts: a package of Very Vanilla Medium Envelopes AND the Share What You Love Embellishment Kit (an $18.00 combined value)! This bundle costs $91.50 (before tax and shipping), and the item number is 149525. 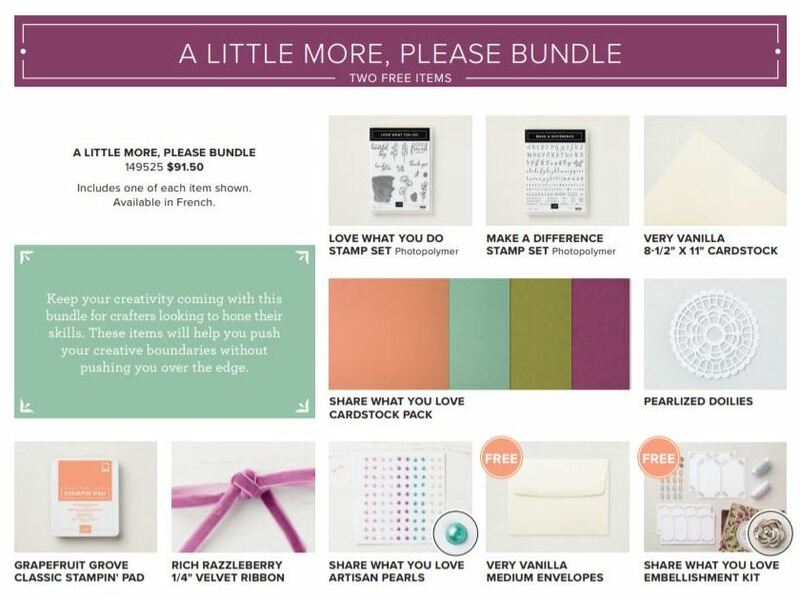 This is the most inclusive bundle available and includes THREE free gifts! 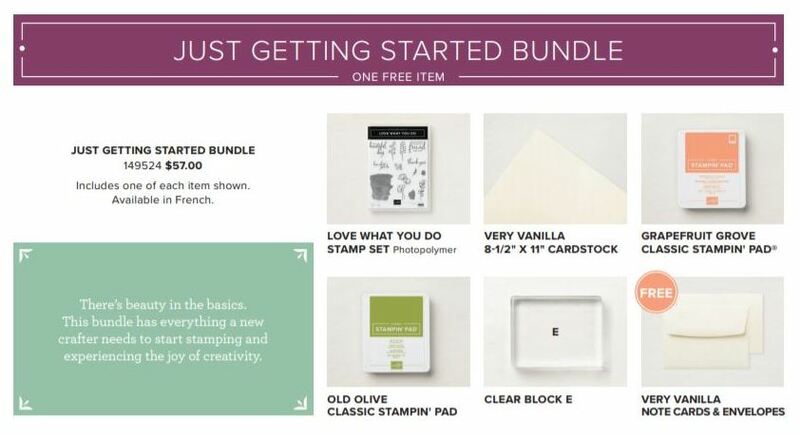 The free gifts include the two gifts from the previous bundle, as well as an exclusive stamp called the Statement of My Heart Stamp (a $30.00 combined value). This bundle costs $127.50 (before tax and shipping), and the item number is 149526. 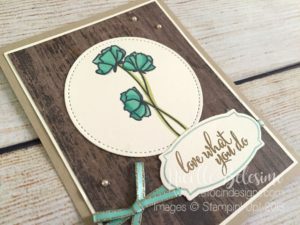 In addition to the three Share What You Love bundles, the early release also includes a bundle of the NEW 2018-2020 In Color Ink Pads! Get all FIVE colors in the NEW ink pad style for only $33.75, which is a savings of 10% off the cost of them separately! This is a great way to get the new colors early AND save a bit of money at the same time! The item number for the In Color ink pad bundle is 147153.